She went to a foster home and then another and then arrived at ours one November evening in 2013 after not fitting in with the other cats in the house and being difficult with humans too. Betty was indeed not the easiest cat to deal with. She grumbled at us constantly and you couldn’t pick her up without fear of being ripped to shreds! But, we didn’t give up on her and she became part of our family, grumpiness and all. It took her a while to come out of herself and realise that humans were safe. Not safe enough to be pick her up or even stroke her for a very long time, but we coexisted in the house and she put up with the other foster cats that lived there. Eventually, she would let us stroke her and she would cuddle up to us and purr very loudly. Picking her up was still a definite no-no, but we could live with that. I knew how hard it was for cats to get adopted, but I still tried. She went to adoption days, but got so cross we couldn’t even put her back in her carrier at the end of the day! So we gave up taking her. I despaired that she would ever get adopted, especially in the UAE. She needed a very special, very patient family who would love her huge personality. I dreamed about her having a home in England with a garden to run around in. Over time, her amazing personality started to shine. She was incredibly determined. She loved to play – the sight of her wiggling her bottom as she tried to catch the laser pointer was hilarious. She became a little annoyed with the other cats chasing her (especially one of our blind ones) and realised that if she jumped up onto the banisters, she could escape from them. I will never forget sitting in the lounge downstairs and a very shocked looking Betty suddenly appearing from nowhere as she had slipped off the banister and fallen a very long way onto the floor. Luckily she was not injured, but we had to put upside down masking tape on the banisters after that to deter her! Betty loved her food more than anything. She screamed for the tuna ice cubes I had made for the cats that lived in the compound. She fought off the others for wet food. But most of all, Betty loved Dreamies. It didn’t matter where we hid them, she found every single packet and ripped it open to devour the little treats. And it is because of this obsession that Betty Boo found her forever home. When I lived in the UK, I used to do parkrun every week. There was a podcast led by Danny Norman and because I missed parkrun when I moved, I used to listen to it every week. 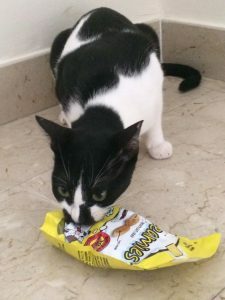 Well, one week, Danny was talking about how his cats loved Dreamies, so I posted a picture of Betty savaging a packet of them on their Facebook page. I said she was looking for a home and could fly to anywhere in the world. 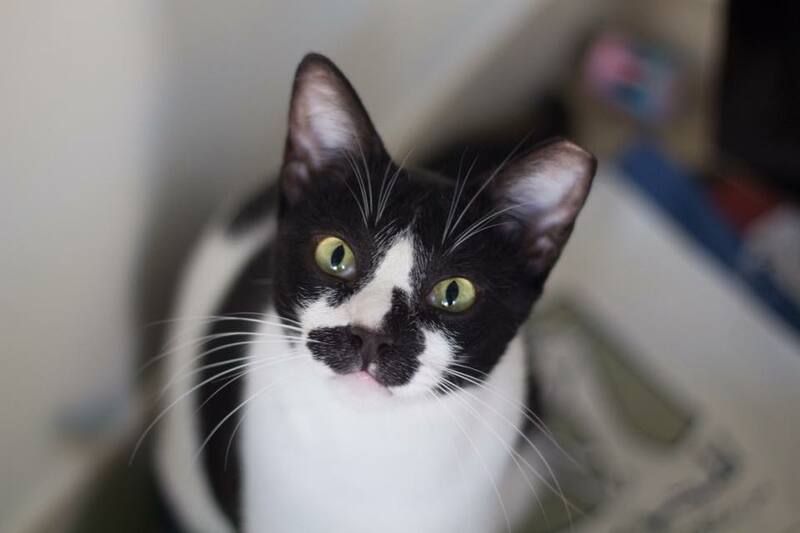 A friend saw that post and said they would adopt her, but at that time Betty really needed to be an only cat, so they couldn’t take her, but adopted Goofie, one of our other fosters. Danny talked about Betty and Goofie on the podcast and was genuinely thrilled that Goofie had found a home because of it. Betty had her own Facebook page and Danny and his girlfriend, Libby, followed it and regularly commented on her pictures and updates. Then one day in September 2015, after another plea from me for Betty to have her own home, Libby posted that she thought they should adopt Betty. I remember getting goosebumps at the thought that she might finally be adopted. I was worried that they had two cats already, but Betty was much better with other cats by that point and I knew that if they were chilled with her, then she would be with them. It all happened very quickly after that and now I’ll let Danny take over the story of how Betty Boo had just been waiting for the right family to come along…. On the 30th of October 2015 I posted a video on Facebook. It’s very special to me as it shows Betty Boo’s first few moments in her new home. There had been a fear that upon arrival she would not come out of her carrier for a while but this was not to be the case. I will never forget her wide eyes as the deliveryman put her at our (‘our’ being my girlfriend, Libby, and I) doorway. It genuinely looked like she was excited, it was like she knew she was home. I swiftly and delightedly brought her in to our flat (Libby was at work, so it was just me and Betty Boo), after a thankful and jovial chat with the deliveryman and opened her cage as soon as possible in the living room. She’d been in her cage for hours and hours. I had tracked her journey overnight online via the Planefinder app. I felt she’d surely be busting to get some space (and maybe for the toilet). I was right (about getting some space). She popped out of her carrier and announced herself to my world in what was to be typical Betty Boo style, with aplomb. She was carefree. I had been advised she may be nervous at first settling in. She may be frightened and wary. None of this was true. She was too strong a character. She looked all around with great curiosity, just as cats do. 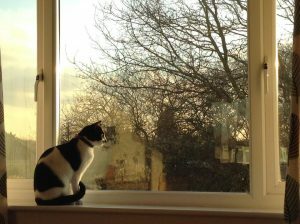 She took to both the windows at either end of our living room, patrolling up and down their ledges, looking out on a conventional set of English gardens and did a ‘Betty grumble’ at the cats she saw down below. Two of which were ours, her new brothers, Ollie and Badger. I estimate it took no more than 45 minutes before she was on my lap looking for greater attention. I had been told she didn’t do laps. The one thing Betty did do is defy convention or expectation. I felt very honoured. I felt she knew pretty much immediately I was hers and she was mine. I was to protect her here on in. She never liked being picked up however by me, or anyone. That was her one constant. I’d made a deal with Libby. 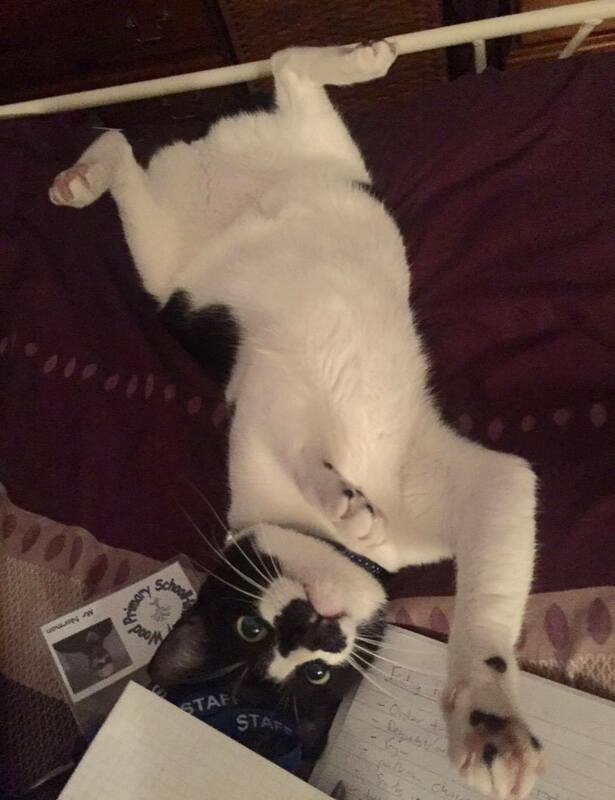 If I got a job (I’d left the employment of parkrun in early 2015) we could get another cat. I managed to get a job and the prospect of Betty raised itself at the right time. Something clicked with me, it felt right to be the one to bring her to the UK and give her a forever home. It just felt right to take the punt. It wouldn’t be cheap, it wouldn’t be as easy as giving a foster cat from the UK a home. Nonetheless, something just burned in me to get Betty over. Vikki created a crowdsourcing page to fund her transport over and paperwork, and I was blown away by the donations collected. The target was reached well before the deadline. I will always feel indebted to the donators. I don’t think I could ever repay their kindness in a proverbial sense. Betty was flown over on an Emirates Airbus A380. She flew in a better plane than I ever have been in. I love this fact. There was a tentative moment where she may not have been allowed to leave Dubai due to a small change in procedure, that got reversed, but that moment in time is gladly consigned to the dustbin. It was touch and go but she was allowed to fly and of course she came to Epsom in Surrey to live with me. We had her for 8 months. 8 amazing months of fun-filled Betty Boo-ness. It was far, far too short a time. It was never and never will have been enough. Within that time she made a huge impression. This is where I fear I will forget a few of the numerous little instances that made her our Betty. She was stubborn. She was fearless. She was curious. She was hilarious. She was demanding. She was loving. She was vocal. Very vocal and she had such a cute, raspy meow that defied her femininity. What I wouldn’t give to have her berate me one more time, ordering me to give her a meatstick piece or Dreamie. She loved those. She got to climb trees, play in grass and have a garden of her own. Something she’d never have gotten to do in Dubai and something Vikki had always dreamed for her. She scaled those trees like Spiderman up a skyscraper. 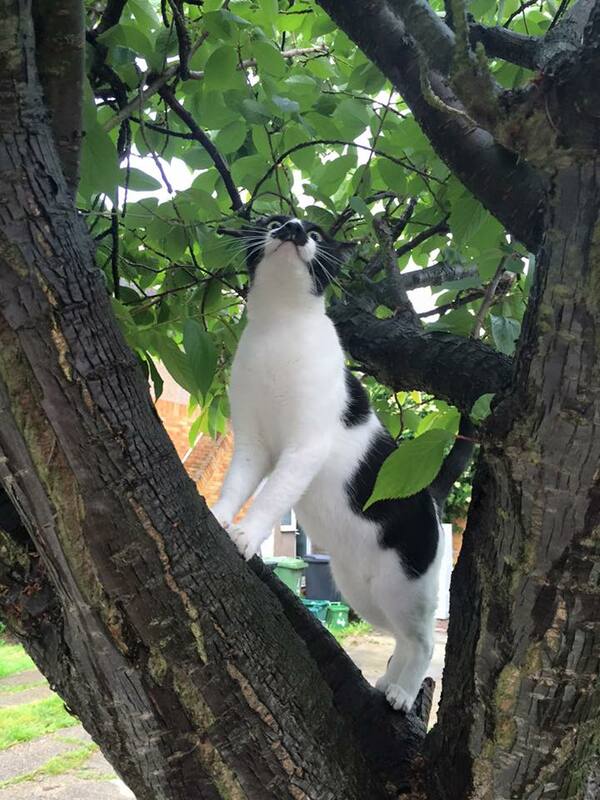 I’ve never known a cat to show total lack of regard for her own safety and just go up branch after branch at break-neck speed. It was funny watching her slide and jump her way down too. She never hurt herself doing this. She never got stuck. She killed plants. 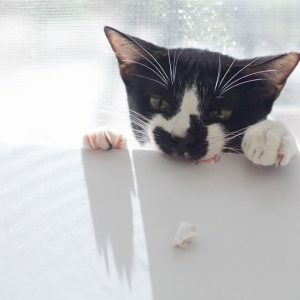 Every single plant that Libby owned in the flat became part of Betty’s diet or scratching routine. There is a dead Yucka plant in the living room, shredded to oblivion by Betty’s claws. Libby adored her and Betty adored Libby. I do believe being the ladies of the flat that they bonded in a special way. Libby became extremely attached to her. Betty made a great friend in Badger, eventually. Badger and Ollie took a few weeks to become accustomed to her but within time they would crowd me in the kitchen at treat time, huddled close together. Ollie ironically tolerated her (meaning he’s a very independent and alpha male cat) most in the last few weeks we had her. I even picked her up and took her over to Ollie a few days before she died. He washed her head lovingly. Maybe he knew. Badger was her partner in crime, assisting Betty in waking me up at 3:30am for their wet meat feeding. It was always 3:30am. Betty was impeccable in her timing, and I don’t know how she did it. She must have had a kitty alarm clock stashed away. She started to become noticeably different in her character from Thursday the 30th June. Nothing major at first, just a bit more sleeping, less vocal than usual. No waking me at that eyeball-aching 3:30am for feeding. I began to worry and kept tabs on her. I noticed that she wasn’t using the litter tray as often as usual and also didn’t think she was eating as much. Usual behaviour seemed to happen less and less and she became withdrawn. I was compelled to take her to the vets fearing for her health and wish now I’d taken her sooner and will always wish I had. I’ll never know if she could have been saved had I acted faster. It may not have made any difference, but it may have. I knew deep down something was gravely wrong. It soon became the weekend and on Saturday night I made the decision – she would go to the vets first thing in the morning. After allowing her an additional evening of rest and care in our presence the emergency vets were called first thing Sunday morning and I rushed her over at 8am. Unfortunately things went downhill pretty fast. We received a call on Sunday afternoon that the diagnosis was FeLV. We’re not sure about this to this day, but she was anaemic from something and ultimately this anaemia is what killed her. We took her over to our own vets first thing Monday morning. The vet, Sofia, promised to try anything and everything to make her better. She even offered her own cats for a blood transfusion as things became more critical. We’ll never forget this. We received a call at 6pm on that Monday, the 4th of July, from the vets, which didn’t relay good news. Betty was slipping away, didn’t have long and would we attend. Libby and I shot out of the door and drove up the road as fast as allowed. Betty was laid out on a table with air and gas being administered. She was suffering, she was pale. Her jellybean toes were no longer pink, her gums milk white. We were losing her. There was nothing we could do. I even shot home and collected Badger in case of a last roll of the dice were possible with a blood transfusion but it was far too late. Poor Badger spent time in the vets without doing much apart from being present in the room next door whilst Betty passed away. I watched as Betty slipped from us. She fought, and fought hard every inch of the way. She was a natural born fighter. Libby held her head, I held her paw, we stroked her and kissed her cheek, her heart rate slowed and Sofia the vet listened to it as it came to a halt. I asked if she’d gone. She had. The finality of Betty’s life struck all too soon. She was three and a half years old, around 30 in human years. Tragically early. She had so much more to give. I was heartbroken, Libby was wrecked. What we wouldn’t give to have her back being her rambunctious self. There have been times where I haven’t been able to breathe properly thinking too deeply about her death and all the little things she did that will never happen again, and which you take for granted. As you can imagine it’s hit us hard emotionally. Betty Boo was significant to me in more ways than just a simple pet. She gave me a focus and purpose at times when I needed it most. She came into our lives via an extraordinary circumstance. When you have to look after an innocent dependent you have a purpose, to fulfil that duty. It keeps you strong at times when it would be easier just to pack it all in. At the time of writing, a day after she died, the flat has seemed ever so empty. So much quieter. Missing a puzzle piece of life. I keep looking over at her cat bed to the right of me and wish she was there curled into a snoozing ball. She’s not. She’s gone, and that’s hard to take. It’s hit Libby hardest most of all. I never realised how deeply ingrained her love for Betty was until now. Betty was mine, I adored her so much, she loved to sleep and rest on my lap on occasion, on her terms, but the heartstrings between Libby and Betty were tightest. I didn’t think anyone could adore her more than I, I was wrong. I am not a man of faith or spirituality, but I hope to meet her again someday. It’s too early to say goodbye. I want to know she knew we were there for her in her last moments, loving her. I am grateful for having her in my life. Pets are family and she was a much loved member. Sleep now Betty Boo. I love you.